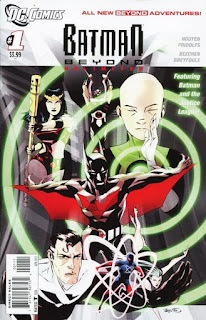 When Batman Beyond first came out as a cartoon series it was met with, at least from my point of view, criticism. Here was this new Batman that had a suit that could fly, and all this tech that seemed it fit better on Iron Man than on Batman, but slowly it won me over. As a cartoon series it rewrote the Batman mythos and as a comic series it could do, the exact thing. Terry McGinnis is an awesome Batman and brings a level of snark to the Dark Knight that he has never had before. 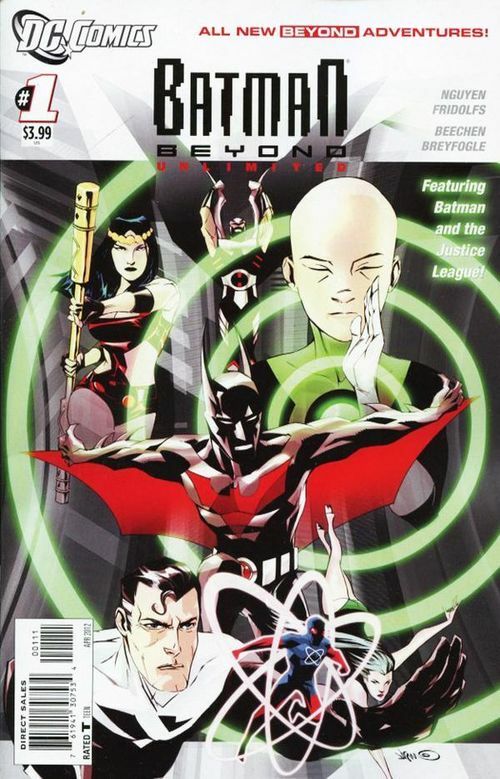 If you are unfamiliar with the Batman Beyond universe here is the skinny: The story takes place in 2019, Terry McGinnis is Batman, Bruce Wayne has basically taken Alfred’s role staying in the bat cave with Ace the Bathound, Barbara Gordon is the police commissioner. There are several different gangs that call themselves the Jokerz. All caught up? Good. This comic just jumps right in the storyline starting out with Batman trying to stop one gang of Jokerz from robbing an antique magic shop. They are from Star City and are the second out of town group to try to vandalize Neo Gotham. Terry and Bruce are trying to figure out why all these gangs are converging on Neo Gotham when Terry is attacked by yet another group of Clowns, taking a good beating before defeating that group as well and flying off. We’re left with a panel of yet another group putting on clown makeup. The second part of this book has to do with the Justice League Beyond and that story is basically an intro story in the larger arc. It introduces the characters to the reader and lays the plot for a much bigger story that mainly has to do with Cadmus. If you are unaware, the members of the Justice League Beyond are: Warhawk, Big Barda, Green Lantern Kai-Ro, Aquagirl, Superman, Batman (Terry McGinnis), and Micron. The storytelling is very similar to an episode of the cartoon series which is not a bad thing and makes for a quick read. The writers do a great job following the series and keeping it going, and the artists also do a fantastic job transferring the series to a comic as well. In my opinion if you were to pick this comic up with no prior knowledge of what’s going on you’d be lost, but if you enjoyed the cartoon series then this book follows suit. There are lots of technical sci-fi storylines and perhaps some darker aspects, and the book is a new spin on the Dark Knight and delves into different aspects that Bruce Wayne Batman didn’t or couldn’t explore.